Broadly speaking the aerators themselves can be categorized into either the splasher type or bubbler type. Examples of splashers are paddlewheels, wavemaker, waterlift pumps and fountain splashers. Examples of bubblers are Injectors, diffusers and venture. Availability and access of power to the Aeration unit itself will be a deciding factor as will the type of aeration required. Solar, whilst convenient, still has its limitations and may not suit your application. Talk to us about your requirements and let us provide a solution for you. 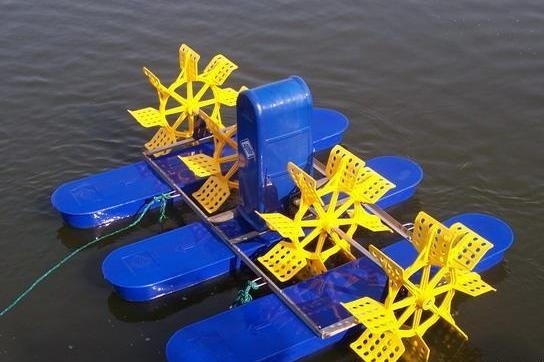 Paddle Wheels are considered to be the most effective spontaneous type of splash aeration. They are capable of simultaneously being able to introduce and distribute oxygen across a broad area of water. Models range from 1hp - 3hp and are available in a single or three phase configuration. Known for their low maintenance and ability to introduce instantaneously dissolved oxygen. All units carry a 1yr warranty. Injectors are an example of a bubbler using a propeller to bind air and water. Propeller Aspirator pumps are suitable for farm dams where a little more depth penetration is required. They are often used in conjunction with paddlewheels to enable a mix of shallow and deep aeration. 2Hp Models are available in single or three phase. The wavemaker is a new addition to our range being suited to waste water settling for ponds where maximum agitation along with a lot of splash breakup is required. Known for its vigorous churn and extended current. 2hp models available in three phase. Diffusers terminally disperse air flow by introducing bubbles into a column of water to provide both oxygen and circulation. The diffuser material can be made of many different mediums and types - perforated tube, ceramic stone or membrane discs, to name a few. Diffused aeration with respect to power consumption can be a comparatively low-cost choice of aeration but it does have its constraints. Talk to us about your requirements. Blowers are low cost economical means of delivering a high volume of air to diffusers. Known for their easy maintenance and low noise blowers are suitable for a use where there is a minimum head pressure and transfer friction. With a myriad of sizes available in single and two stage - single or three phase let us know your requirements. Optional extras include the safety by-pass valve to prevent obstruction burnout and the air intake filter for the prevention of contaminants - both sold separately. Diamond networks supply Linear air pumps, both the Diaphragm and piston type capable of delivering a medium air flow with a very low power consumption rate. Linear pumps provide a simple but effective means of connecting to disc diffusers by weighted or unweighted tube. Diamond Networks supply industrial pumps - submersible or of the external type. Liquid transfer capabilities with regard to rate and liquid composition will determine pump selection. All our pumps are sold with a mechanical warranty - service parts are available. The Eco venturi is capable of delivering a convenient but simple means of Aeration. All that is necessary is a water pump - submersible or external. This venturi is especially suited to a small tank setup eg purging or aquaponic tanks. This aesthetically pleasing aerator effectively oxygenates and destratifies ponds by drawing water through a central column and dispersing a plume of water upward and outward. All 3 capacity models are 3 phase with varying plume height and diameter to suit different pond types.